Silver Fox Delivered to You! Are you looking to eat like the king or queen that you are, but you are looking for a more low-key night? We’re thinking sweatpants, messy hair, and a seat in front of the TV—all while eating Silver Fox! A dream come true, you say?! Well, your dream is a reality with delivery from Silver Fox. 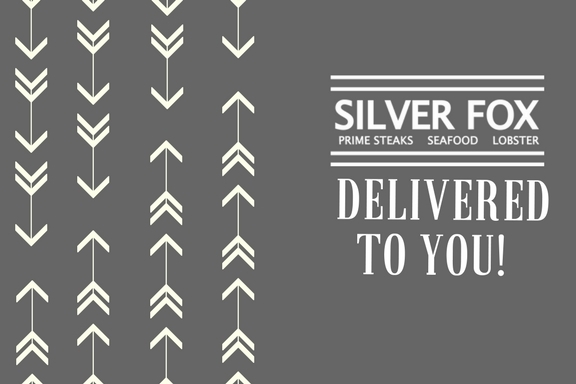 When you have the best steakhouse near you, but you don’t want to change out of your pajamas, you can get Silver Fox delivered to you! Best news ever, right?! Each of our locations has delivery—we will link each of them below so that you can order easily! Eating Silver Fox at Home! Although we love having you join us at any of our locations, we know that is not always possible—whether you’re looking for a chill night with great food, you’re sick (our soups are the best at making you feel better! ), or you just crave a steak and want to eat the best steak in Texas, then delivery from Silver Fox is the answer you are looking for! Our full menu is available to be delivered right to your door! And the best part is, the first time you order (for orders over $15)—it gets delivered for free! Whether you are feeling any of our cuts of meat, a salad, or one of our local favorites (hello, Chilean Sea Bass), you just can’t go wrong! Delivery is a great option, also, if you just don’t feel like cooking but you still want to have a great meal! Have friends coming over for a night, and cooking just isn’t your forte? Don’t sweat it—Silver Fox has you covered! Our delivery services go from 5 PM to 9:30 PM, so whether you’re an early bird when it comes to dinner, or you like to eat late at night, you can still enjoy the best steaks in Texas! Eating at your home doesn’t mean cooking or eating a subpar meal any longer—Silver Fox is here to save the day! It’s great to have the best steakhouse near you, but it’s even better when you can eat it in the comfort of your own home! To order from your local Silver Fox location, click below!